This textbook is suitable for the following courses: Graduate and undergraduate level, online and hybrid courses, small or large classes in organizational behavior, management, leadership, and related courses. Extend meaningful learning beyond lectures and the classroom by pairing a classic, competency-based textbook with an innovative simulation. 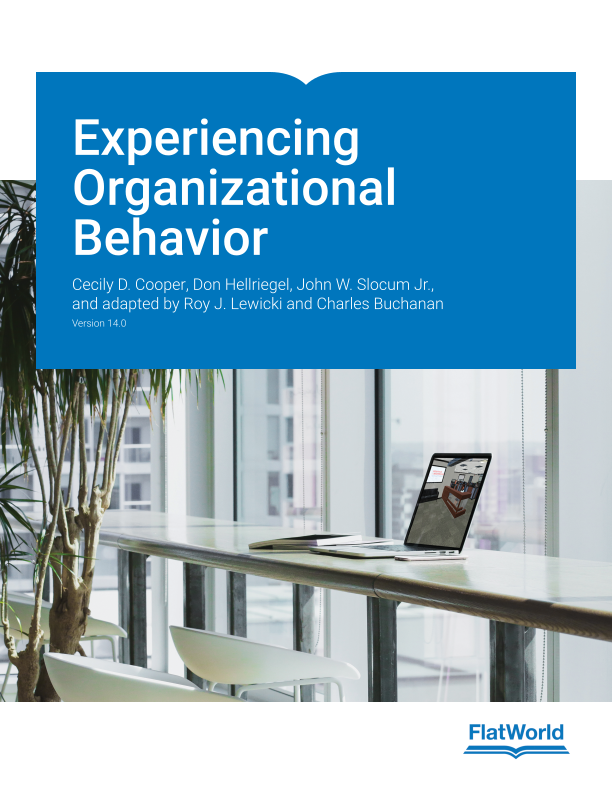 Experiencing Organizational Behavior, Version 14.0 is an adaptation of the renowned market-leading textbook by Cooper, Hellriegel, and Slocum, linked to Positive Learning Solutions’ interactive simulations. Adapted to align with Lead: The Simulation. Flexible design allows instructors to select and order modules according to their needs. The simulation emphasizes a “crawl-walk-run” methodology that increases in complexity as students progress through a module. Student performance provides feedback for assurance of learning through multidimensional, qualitative metrics. Cecily D. Cooper is an Associate Professor at the University of Miami School of Business. Her research interests include trust, trust repair, fairness, and leadership. This research has been published in many leading management journals and has received three national conference awards. Professor Cooper serves on the editorial boards of the Academy of Management Journal, Academy of Management Review, Organizational Behavior and Human Decision Processes, and Journal of Trust Research (Associate Editor). In 2014 and 2016, Professor Cooper served as a program chair for the International Conference on Trust in Organizations sponsored by FINT (First International Network on Trust). Professor Cooper is also a member of the FINT Executive Board. At University of Miami she teaches in the undergraduate, MBA, Executive MBA, and Ph.D. Programs and has previously served as the Ph.D. Program coordinator for the Management Department. She received her B.S. from the Warrington College of Business at the University of Florida and her Ph.D. from the Marshall School of Business at the University of Southern California. Prior to joining University of Miami, Professor Cooper served as a visiting assistant professor at Southern Methodist University. Don Hellriegel is Emeritus Professor of management within the Mays Business School at Texas A&M University. He received his B.S. and M.B.A. from Kent State University and his Ph.D. from the University of Washington. Dr. Hellriegel became a member of the faculty at Texas A&M in 1975. He has served on the faculties of the Pennsylvania State University and the University of Colorado. His research interests include organizational behavior, the effects of organizational environments, managerial cognitive styles, and organizational innovation and strategic management processes. His research has been published in a number of leading journals. Professor Hellriegel served as Vice President and Program Chair of the Academy of Management (1986), President Elect (1987), President (1988), and Past President (1989). In September 1999, he was elected to a three-year term as Dean of the Fellows Group of the Academy of Management. He served a term as Editor of the Academy of Management Review and served as a member of the Board of Governors of the Academy of Management (1979–1981 and 1982–1989). Dr. Hellriegel has performed many other leadership roles, among which include President, Eastern Academy of Management; Division Chair, Organization and Management Theory Division; President, Brazos County United Way; Co-Consulting Editor, West Series in Management, Head (1976–1980 and 1989–1994), Department of Management (TAMU); Interim Dean, Executive Associate Dean (1995–2000), Mays School of Business (TAMU); and Interim Executive Vice Chancellor (TAMUS). He has consulted with a variety of groups and organizations, including 3DI, Sun Ship Building, Penn Mutual Life Insurance, Texas A&M University System, Ministry of Industry and Commerce (Nation of Kuwait), Ministry of Agriculture (Nation of Dominican Republic), AACSB, and Texas Innovation Group. John Slocum is the O. Paul Corley Professor Emeritus at Southern Methodist University. He taught on the facilities of the University of Washington, the Fisher School of Business at the Ohio State University, the Smeal School of Business at the Pennsylvania State University, the International University of Japan, and Amos Tuck at Dartmouth College. He holds a B.B.A. from Westminster College, an M.B.A. from Kent State University, and a Ph.D. in organizational behavior from the University of Washington. He is currently a Lecturer in SMU’s Video Game Development Program, and an adjunct professor of organizational behavior in the Jindal School of Management, University of Texas, Dallas. Professor Slocum has held a number of positions in professional societies. He was elected as a Fellow to the Academy of Management in 1976 for his outstanding contributions to the profession of management, a Fellow to the Decision Sciences Institute in 1984 for his research in behavioral decision theory and a Fellow in the Center for Leadership at the University of Texas, Dallas, 2010. He was awarded the Alumni Citation for Professional Accomplishment by Westminster College, both the Nicolas Salgo and Rotunda Outstanding Teaching Awards from SMU, the Executive MBA Most Valuable Faculty Member Award, SMU Alumni Award for Outstanding Service to Alumni, and was the recipient of the inaugural Carl Sewell Distinguished Service and Distinguished University Citizen Award by SMU. He is a charter member of Academy of Management Journal's Hall of Fame, former Editor of the Academy of Management Journal, founding editor of Organization Sciences, Journal of World Business, and Associate Editor of the Academy of Management Executive and Organizational Dynamics. He is currently co-editor of the Journal of Leadership and Organizational Studies. From 1975-1986, he served as a member of the Board of Governors of the Academy of Management and in 1983-1984, he served as 39th President of the Academy. He is the co-author of 30 books and 134 journal articles. Professor Slocum has served as a consultant to such organizations as Andrews Distributing Company, GeoDynamics, OxyChem, ARAMARK, Elsevier Publishing Company, Governor of Texas, AAA for Northern California, Brakke Consulting, Fort Worth Museum of Science and History, Pier 1, Kimberly Clark Corporation, Kisco Senior Living, UNT Health Science Center, Celanese, NASA, Lockheed Martin Corporation, WorkingSolutions, and Key Span Energy. Roy J. Lewicki is the Irving Abramowitz Professor of Business Ethics and Professor of Management and Human Resources Emeritus at the Max M. Fisher College of Business, The Ohio State University. He is also a partner in Positive Leadership Solutions, LLC. His BA is from Dartmouth College and his PhD in Social Psychology is from Columbia University. Professor Lewicki maintains research and teaching interests in the fields of negotiation, conflict management and dispute resolution, trust development, managerial leadership, organizational justice, and ethical decision making, and has published many research articles and book chapters on these topics. He is an active contributor to the Organizational Behavior Teaching Society, the Academy of Management and the International Association for Conflict Management, and an elected Fellow of all three organizations. He is the founding editor of the Academy of Management Learning and Education. He is the author/editor of forty books, including Negotiation (Lewicki, Barry and Saunders, 2014) and Essentials of Negotiation, (Lewicki, Saunders, Barry, 2015)—the leading academic textbooks in that field. He teaches courses in organizational behavior, leadership, negotiation, and management ethics. Charles Buchanan is a Senior Director of the Fisher Leadership Initiative and a Senior Lecturer with Ohio State University’s Fisher College of Business (FCOB). He earned his MBA degree through the FCOB Executive MBA program. He is also the principal owner and Chief Executive Officer of Positive Leadership Solutions, LLC. Positive Leadership Solutions, LLC provides leadership, teamwork, and business management training to help leaders and organizations achieve their leadership potential. Prior to working at FCOB, Professor Buchanan served 15 years in the military. While in the military he was deployed three times, to Afghanistan, Iraq, and Kosovo. He also completed the U.S. Army’s Ranger School, Command and General Staff College, and various other professional development courses. He continues to serve with the Ohio Army National Guard as the Battalion Commander of the 1-145 Armor Regiment. Professor Buchanan’s primary expertise is leadership; he teaches various leadership and teamwork courses at the graduate and undergraduate level. He has taught Personal Leadership Effectiveness, Developing Leaders through Practical Exercises, Leadership and Character, Managing Individuals in Organizations, Organizational Behavior, and Personal Leadership and Team Effectiveness.